For other uses, see Sodo (disambiguation). "Soddu" redirects here. For other uses, see Soddu (disambiguation). 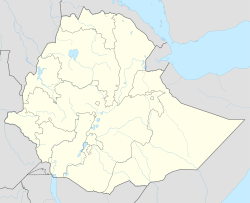 Sodo (Amharic: ሶዶ) or Wolaita Sodo (Amharic: ወላይታ ሶዶ) is a town and separate woreda in south-central Ethiopia. The administrative center of the Wolaita Zone of the Southern Nations, Nationalities, and Peoples Region, it has a latitude and longitude of 6°54′N 37°45′E﻿ / ﻿6.900°N 37.750°E﻿ / 6.900; 37.750 with an elevation between 1,600 and 2,100 metres (5,200 and 6,900 feet) above sea level. It was part of the former Sodo woreda which included Sodo Zuria which completely surrounds it. Sodo is served by an airport. A 166-kilometre (103 mi) road connecting Sodo with Chida, whose construction had started in 1994, was completed by early 1999. Featuring an 80-metre (260 ft) Bailey bridge across the Omo river and five other bridges, this road cost 255 million Birr, and reduced the distance between the Regional capital at Awassa and Mizan Teferi to 400 kilometres (250 mi). According to the SNNPR's Bureau of Finance and Economic Development, as of 2003[update] Sodo's amenities include digital and mobile telephone access, postal service, 24-hour electrical service, two banks, and a hospital. Sodo is also the seat of the Roman Catholic Apostolic Vicariate of Sodo-Hosaena. Currently, Sodo is known for being center of major health and education institutions in Ethiopia. Soddo Christian Hospital has one of the 10 surgical training centers in Africa. The hospital provide a full range of medical, and surgical service, including Orthopedic and General, Maternity, and Pediatrics. Wolaita Sodo University Teaching Referral Hospital is also located in this town and it serves around two million people. The total number of beds in the hospital was 200; out of which 60 beds were in Obstetrics and Gynecology department. In the early 1930s, Sodo was described as the only locality in Wolaita district deserving to be called a town. It had a Saturday market, a telephone line to the capital and a weekly mail courier. Italian ground troops captured Sodo on 27 January 1937; it was there that two Italian generals with their divisions – Liberati with his 25th Division, and Bacarri with his 101st Division – surrendered on 22 May 1941, after a minimum of resistance. The British also captured the remnants of the 21st Division, who had escaped around the north end of Lake Abijatta. The loot included more than 4,000 officers and men, 6 medium tanks, 4 light tanks, 100 machine guns, ammunition and supplies. By 1958 Sodo was one of 27 places in Ethiopia ranked as First Class Township. A branch of the Commercial Bank of Ethiopia was established between 1965-68. The administrator of Sodo Zuria woreda and one-time student activist, Melaku Gebre Egziahber, was arrested in 1975 for encouraging peasants and the urban poor to rise up against "exploiters" in the town. In 1984, a refugee camp was established in the town for the victims of that year's famine. On 6 November 1999, police arrested two teachers in Sodo for objecting to the use of a new language in school textbooks. Student demonstrations against the arrests led to widespread week-long protests and riots. Special police units were brought in to suppress the demonstrations, and killed as many as 10 people, injured hundreds and arrested up to 1,000 others. A former Young Men's Christian Association camp outside Sodo was used as a temporary detention facility for hundreds of demonstrators. Prior to the Ethiopian 2005 General Elections, Amnesty International reports that some members of the United Ethiopian Democratic Forces political party were amongst 200 people reportedly detained under vagrancy laws in Sodo on 22 February 2005. Amnesty International included this incident as one of a series of government intimidation of opposition party activists. The 1994 national census reported this town had a total population of 36,287 of whom 18,863 were men and 17,424 were women. Established in 2007, Wolaita Sodo University (WSU) is a non-profit public higher education institution located in Sodo.WSU offers courses and programs leading to officially recognized higher education degrees in several areas of study. The university has campuses in different areas, including Dawuro Tarcha Campus. Wolaitta Dicha S.C. is an Ethiopian football club based in Sodo. The club won its first domestic cup in 2017, and qualified for the 2018 CAF Confederation Cup, in which the club won and passed Zemalek SC to quarter final. Located in the tropics at high altitude, Sodo possesses a well-moderated Subtropical highland climate (Koppen Cwb), with a pronounced pattern of wet summers and dry winters. Despite being located in the Northern Hemisphere, Sodo is actually cooler in the "summer" than the "winter" due to much higher rainfall in the high-sun season, a phenomenon common to Sodo's region. ^ "Soddo, Ethiopia Weather Averages". World Weather Online. Retrieved February 25, 2012. This page was last edited on 22 January 2019, at 13:19 (UTC).